Attention all Historic Home Lovers! 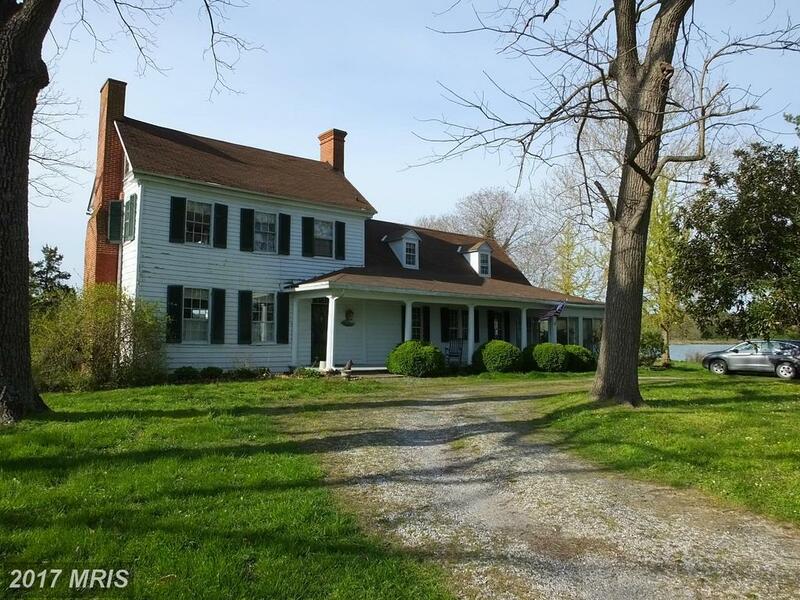 The Unity Hill Proper manor in the Dailsville/Townpoint Road Area of Cambridge, Maryland is truly a must see. Situated on the quiet and calm banks of Lee Creek, the 1706 Dark Road home is a peaceful retreat with access to the Choptank River and the Chesapeake Bay. The Dailsville/Townpoint Road Neighborhood is a long, adjoining backroad of about 7.5 miles. In the Dailsville direction, you have access to the county schools, and main Route 16 which goes right to Route 50. In the other direction, you head towards Hudson Road which gives access to Down Town Cambridge as well as the beautiful and scenic Neck District. This lovely 1800’s home is rich in history. It is nestled back behind picturesque rolling soybean crops at the end of Dark Road, which was the former property of William Preston in 1662. The stunning 5 bedroom, 2 bathroom, and one half bathroom was actually an old Dairy at one time. In fact, it is multiple houses built together as one. This one of a kind home at one time was three separate homes combined into one large mansion! The first original house was constructed in 1845, when there were neither running water nor plumbing – so no kitchens or bathrooms! Later, a fully constructed home with a kitchen was actually floated in on the Lee Creek and set adjacent to the original home. Finally, one last home was floated in via the Creek and placed on the 1706 Dark Road property. As years went by and home amenities became more advanced, the home was eventually combined into one solid structure. The home is intriguing with many different stairways and cubby areas, but it flows beautifully! The 2,709 square foot house has 4 fireplaces, 4 porches, vintage woodwork including wide plank wood floors, built-in's and updated country kitchen. It boasts a 600 foot shoreline with a pier and a historic ice house. Along the shoreline, the property also comes with several outbuildings to include an Historic Ice House, Pump House and detached 2 car garage. If you’re looking for an immaculate cared for historic waterfront home that is not too far away from the amenities in the city of Cambridge look no more! 1706 Dark Road in Cambridge, Maryland is situated in the sought after area of Dailsville/Townpoint Road which is just a 10 minute drive to either Route 50 or Downtown Cambridge. The City of Cambridge is an historic town in and of itself. With beautiful and walkable cobblestone streets and daily historic tours, you can easily spend an entire day exploring this area! Cambridge has many shops, bars and restaurants right in the attractive historic district which is also near the water. Take a stroll down High Street to Long Wharf every Saturday for the local farmer’s market. Laugh and consort with friends after a long day at the local yet famous brewery Real Ale Revival. The Cambridge area also has award winning golf resorts, community pool, local YMCA, and even hosts the Eagleman and Ironman Triathlons for the athletes out there. Not only will you have the amenities of Downtown to keep you busy and thriving; the property has extremely great hunting and fishing. The Unity Hill Proper home is set on 3.72 +/- acres of land to explore White Tale, Sika Deer, TEAL and Black Duck and Canada Goose hunting. All in all, with the fascinating history, fun things to do and not to mention a WATERFRONT view from your master bedroom, how could you pass on this listing?! Come Explore Unity Hill Proper Today!